Mr. West finally graduates and he does it with honors. Kanye has referred to himself as the best in the business and backs it up by curbing fans' curiosity with his recent CD Graduation. The album gives fans a full dose of the egotistical talent that makes for a delectable selection of recordings. Kanye's talent to see a hot track is evident as he blends the scratchy-sounding "Barry Bonds" featuring Lil Wayne, with hot club joints like "Flashing Lights" featuring Dwele and piano-heavy hits like "Homecoming" featuring Coldplay's Chris Martin. In his intro "Good Morning" we are led slowly, unexpectedly almost, into the greatness the next 50 plus minutes will reveal. 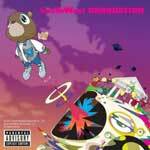 If not "the best in music" as he has claimed, Kanye has definitely outdone himself and many of his rivals in his genre. Though many of the tracks ooze self-centeredness, he credits his ideas of achievement throughout the CD in various lyrics. With an album like this, you've got to hand it to the entertainer and we can only hope that hits like "Stronger" and "Good Life" aren't the only ones that will hit the radio air-waves or shine through the dark of our favorite juke joints.